The Illinois Country ( French: Pays des Illinois, lit. "land of the Illinois (plural)", i.e. 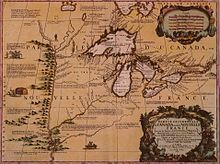 the Illinois people) — sometimes referred to as Upper Louisiana ( French: la Haute-Louisiane; Spanish: Alta Luisiana) — was a vast region of New France in what is now the Midwestern United States. While these names generally referred to the entire Upper Mississippi River watershed, French colonial settlement was concentrated along the Mississippi and Illinois Rivers in what is now the U.S. states of Illinois and Missouri, with outposts in Indiana. Explored in 1673 from Green Bay to the Arkansas River by the Canadien expedition of Louis Jolliet and Jacques Marquette, the area was claimed by France. It was settled primarily from the Pays d'en Haut in the context of the fur trade. Over time, the fur trade took some French to the far reaches of the Rocky Mountains, especially along the branches of the broad Missouri River valley. The French name, Pays des Illinois, means "Land of the Illinois [plural]" and is a reference to the Illinois Confederation, a group of related Algonquian native peoples. 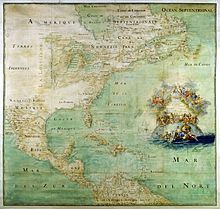 Peoria was at first the southernmost part of New France, then the northernmost part of the French Colony of Louisiana, and finally the westernmost part of the newly formed United States. Fort Crevecoeur was first founded in 1680. Another fort, often called Fort Pimiteoui, and later Old Fort Peoria, was established in 1691. French interests dominated at Peoria for well over a hundred years, from the time the first French explorers came up the Illinois River in 1673 until the first United States settlers began to move into the area around 1815. A small French presence persisted for a time on the east bank of the river, but was gone by about 1846. Today, only faint echoes of French Peoria survive in the street plan of downtown Peoria, and in the name of an occasional street, school, or hotel meeting room: Joliet, Marquette, LaSalle. ^ a b c Carrière, J. -M. (1939). "Creole Dialect of Missouri". American Speech. Duke University Press. 14 (2): 109–119. doi: 10.2307/451217. JSTOR 451217.